In late 2012, I wrote about a newly discovered oil painting by artist Costantino Proietto (1910-1979). 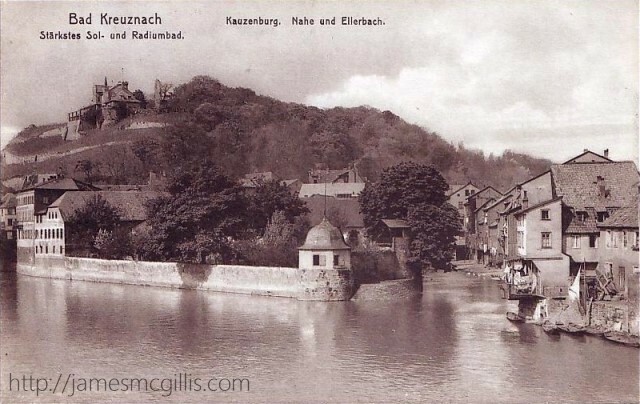 On the back, the red felt-tipped inscription read “Bad Kreuznach”, which is an ancient town in Germany. In 1964, the artist had sold the painting to Ms. Marion Fortune, an American working in Germany at that time. Her heir, Ms. Shelly Jenkins had recently received the painting and had planned to keep it. In early 2014, Ms. Jenkins changed her mind and sold the painting to me. 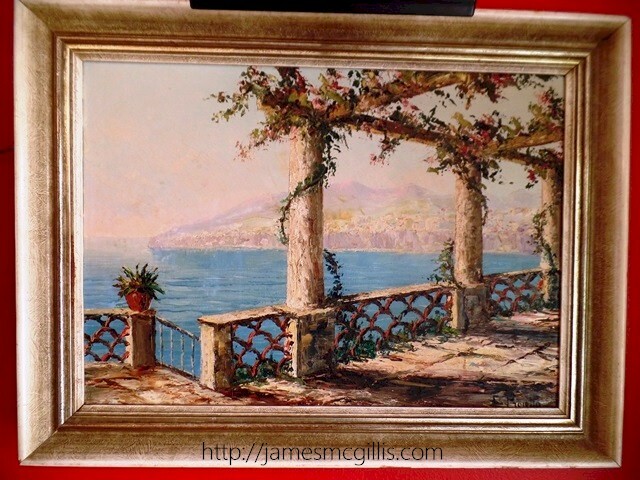 Upon its arrival, I gently cleaned the painting and then added a new custom frame. Otherwise, it looked as it did when Tino painted it, fifty years ago. Still, there was mystery surrounding the painting. 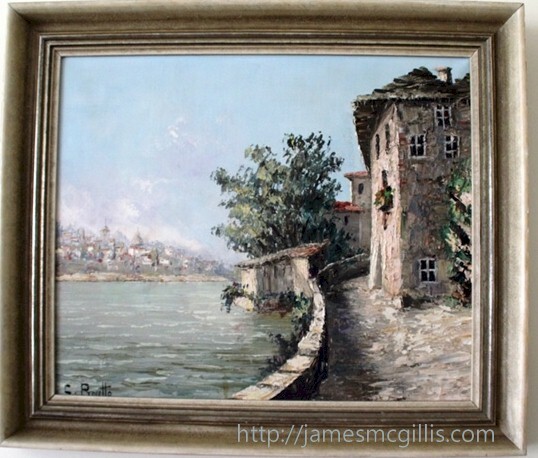 With its depiction of a river scene and prominent buildings, I assumed that someone would know more about the setting. As I have learned, if I put C.Proietto images out for the world to see, someone will write and help me identify a particular scene. In July of 2014, Ms. Petra Tursky-Hartmann of Frankfurt, Germany wrote to me regarding the location featured in my newly acquired C.Proietto painting. At that time, she wrote, “The two pictures show a place called ‘Little Venice on the Ellerbach’ in Bad Kreuznach (I’m born in Bad Kreuznach). 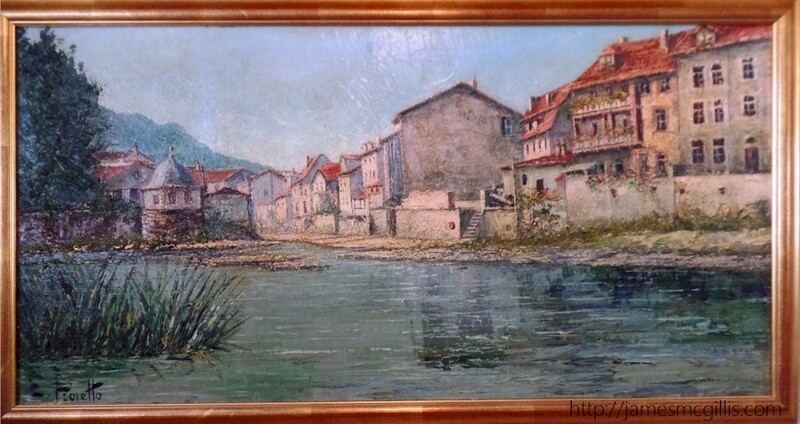 The painting shows the place where the small river ‘Ellerbach’ is flowing into the larger ‘Nahe’ river. It is an historical place, where the skinners lived during the last century. Due to several floods, they were allowed to fix there balconies high over the river. Because of the heavy smell from their work, it was not the best place to go. Still, many poor people had lived there for hundreds of years. Today, animal processing is no longer allowed, but these kinds of balconies still hang over the river ‘Ellerbach’. In a subsequent email, Ms. Tursky-Hartmann provided details that are more accurate about her mother’s C.Proietto original oil painting. Its title is "Cattolica - Terraza Cafe Eden Roco Italia". 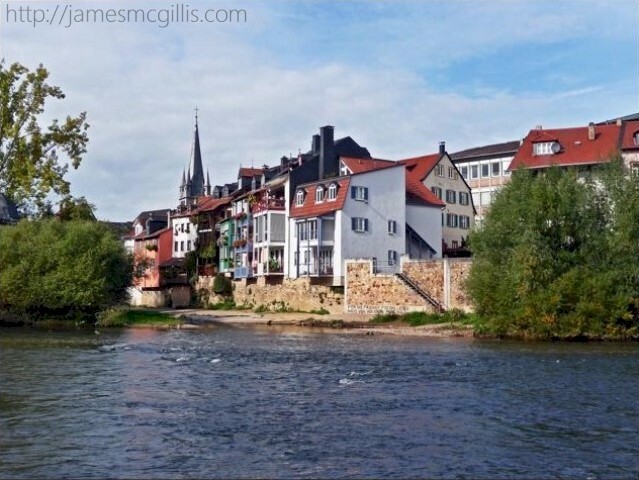 “Yesterday, I visited my mother in Spabrücken, close to Bad Kreuznach, where she lives with my sister. I told my mother about your email. She was interested to hear what I read to her, as I translated your email. My Mother told us, that she started to work in 1952 and went to Italy for holidays during the late 1950s. 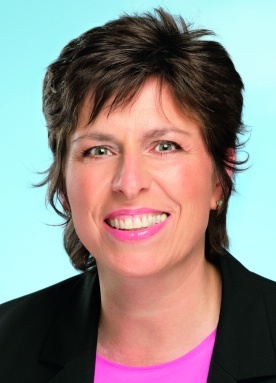 At that time, she was working as a clerk for the local Court in Bad Kreuznach. In 1959, she accompanied my father to Riccione and Cattolica, where they stayed in the Hotel Moderno. During her earlier tours, she travelled by bus, with a group. She always had an interest in Italien Culture. In the 1950s, many Germans travelled to Riccione-Cattolica and Rimini. She liked, that the osterias and hotels were close to the sea and that dining and drinks were very cheap, and that the climate was warm. It was not so easy for Germans to travel through Europe after World War II. However, Italiens, she said, had no problems with the Germans, because of Mussolini’s friendship with Hitler. She said that the Germans could have good parties at Rimini. Once, while in Cattolica, at the Terraza Cafe Eden Roco, she said she saw ‘a painter’ - maybe C.Proietto. There were several painters close to the beach offering there paintings. She remembers that ‘this painter’ painted three pictures on three easels at the same time and with very high speed. With the same colours, he painted each picture. Selecting one, she liked this picture very much from the first moment. She then bought the picture from the artist for 400 German Marks. The painter rolled the picture in a stovepipe, because she was travelling by bus with a very small suitcase. 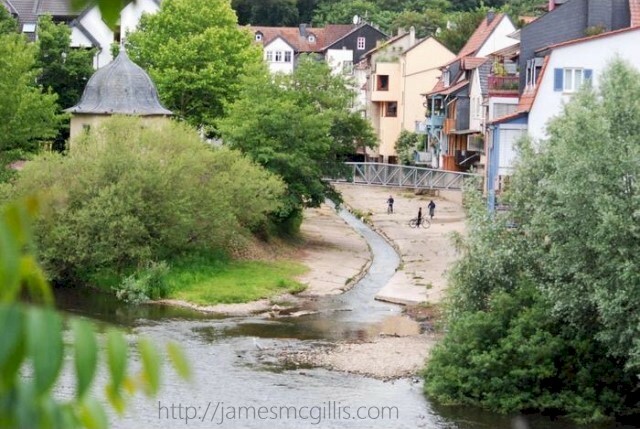 When back in Bad Kreuznach, she went to the Bechter Gallery, where they put the frame around it. When I asked her about the year, she did not remember exactly. However, the inscription on the backside of the picture indicates ‘Pro 14360’. If this is true, the picture was finished in March 1960. I was born on June 5, 1960. Therefore, in spring or summer of 1960, she was definitely not in Italy for holidays. 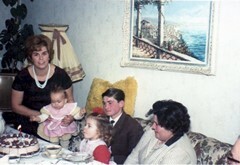 My younger sister was born on November 17, 1961, so maybe Mama was in Italy in early spring 1961. After mentally digesting everything that Ms. Tursky-Hartmann had written about her mother’s C.Proietto painting, I stopped to think about another C.Proietto I had purchased a year earlier. 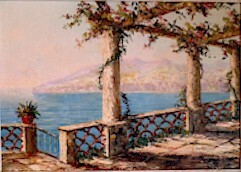 It too was of a seascape, featuring a prominent pergolato, with a shoreline receding into the distance. Until then, I had no clue as to its location. In his earlier works, Tino Proietto used only his signature to authenticate his own work. Later, in the 1960s and beyond, he applied a wax seal to the corner of a sticker, which authenticated each new painting. After reviewing the details of the Tursky-Hartmann C.Proietto, I recognized certain elements contained within it. 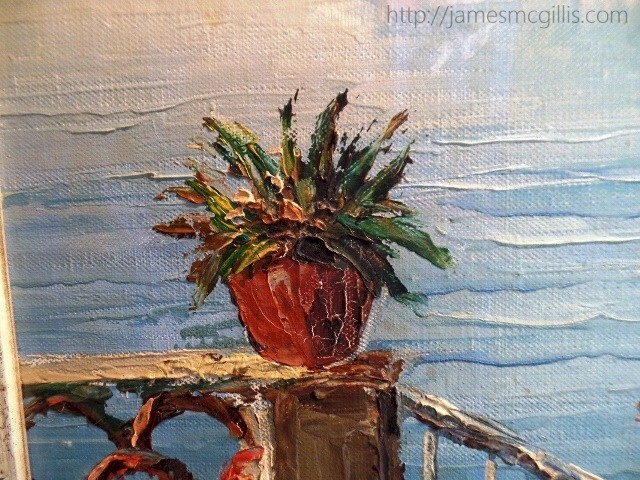 For instance, the distinctive latticework wall and the potted plants were almost identical to the ones in my mystery painting. 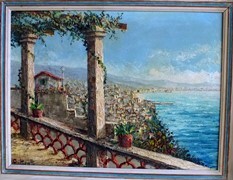 If Costantino Proietto stood near the shore at Terraza Cafe Eden Roco, painting the same scene from three different angles, the result would be a tryptic, showing the broader scene. Although painted later than mine, the Tursky-Hartmann painting would form the left panel of the tryptic. The author’s painting would form the right panel. Where, I wondered, would I find the middle panel? I surmised that it would show the scene, looking straight out to sea. As happens so often with C.Proietto paintings, they provide some answers to aspects of the mystery. Likewise, each new C.Proietto painting brings new questions with it. With his self-designation as a “kunstmaler” (meaning production painter, in German), it could only have been Costantino Proietto at Terraza Cafe Eden Roco simultaneously creating three paintings. Why paint only one masterpiece when, as the “master of impasto”, you can paint three at a time? That would be the consummate artist, Tino Proietto, in his mid-century prime. 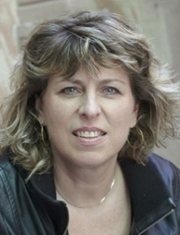 I offer my thanks to both Ms. Petra Tursky-Hartmann and her mother. First, they identified the location of the Marion Fortune C.Proietto as “Little Venice” in Bad Kreuznach. Then, they went on to explain the history of both known Costantino Proietto "Terraza Cafe Eden Roco" paintings, being theirs and my own. 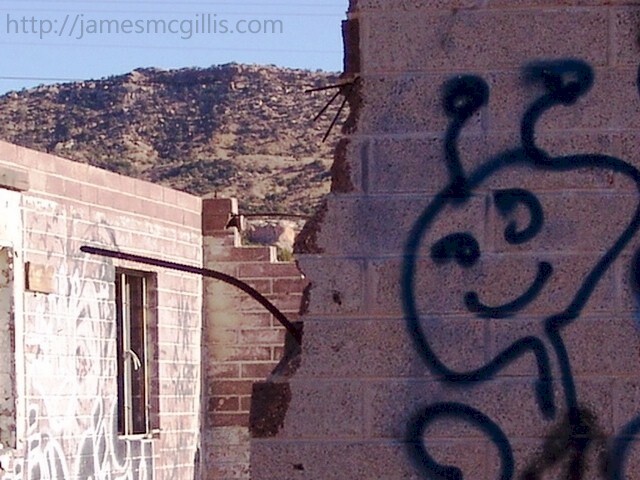 In September 2013, I wrote about the state of the art at Cow Springs, Arizona. The term “Cow Springs” has a triple meaning. It stands first for the elusive springs once used to water cattle. 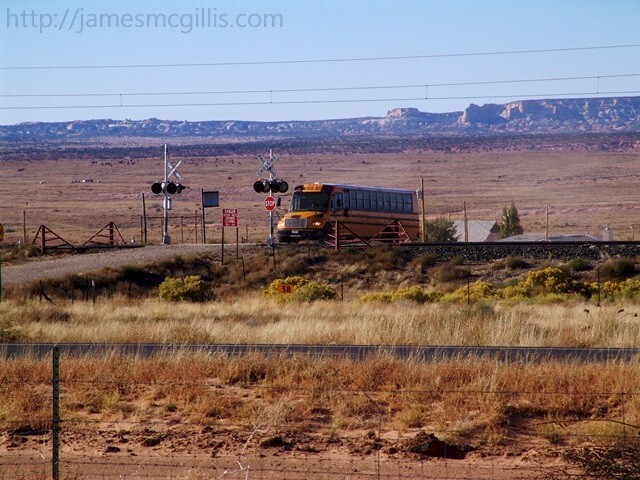 Second, it stands for the small Navajo community that occupies a space between Cow Springs Lake and U.S. Highway 160, thirty miles south of Kayenta, Arizona. Third, the name is synonymous with the long defunct Cow Springs Trading Post and service station, which once stood across the highway from the settlement. 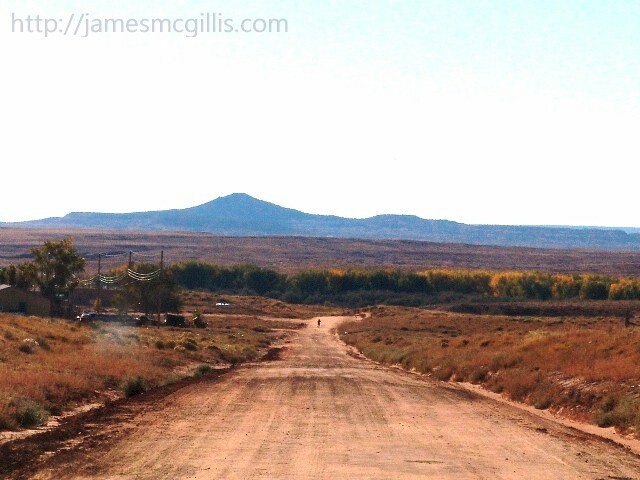 Being too small to rate its own U.S. Census district, no one knows how many Navajo actually live in Cow Springs. There are no discernible commercial services available in the settlement. With that, the “Cow Springs Head Start” nursery school appears to be the most prominent enterprise in town. To see for myself, in October 2013 I took a quick driving tour of Cow Springs. After looking around, I would guess the place has a few hundred residents. After inspecting the ruin of the former Cow Springs Trading Post, I then drove across the highway, over a railroad grade crossing and into a tiny hamlet of mostly well-kept frame houses. Turning south on what appeared to be the major road in town, my path paralleled the highway. With my travel trailer in tow, I could not locate Cow Springs Lake, which I knew lay to my southwest. Although I could see the growth of a tree line upstream of the dwindling lake, I could not risk becoming stuck on some dead end road. Despite the fact that the Cow Springs Trading Post closed over forty-five years ago, human activity in and around the ghost-building remains high. The two artistic implements of choice remain spray-paint and the sledgehammer. Almost equal in their usage, paint covers old art as the hammers continue deconstructing what little remains of the building. Since my previous visit, in the spring of 2013, the rate of destruction was astonishing. Even the paint on the old Standard Oil Products pole-sign appeared more flaked and baked in the sun. When observing public art, most humans tend to like older, more traditional works. 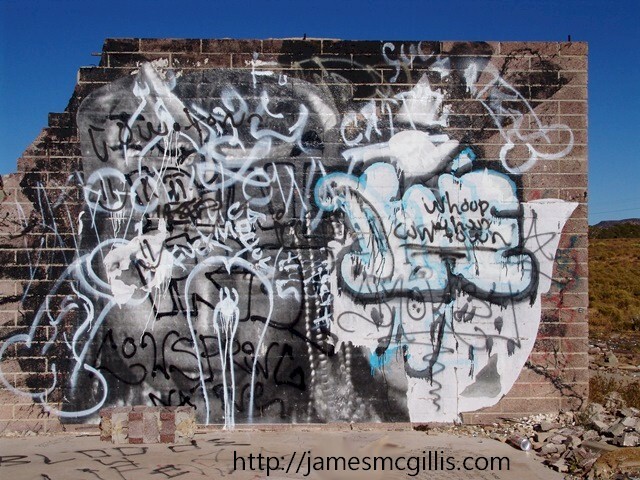 Although portraits of warriors and braves once adorned the concrete block walls of the ruin, most are now gone or covered with many layers of seemingly random words and images. If we can surmise any underlying theme within recent art at Cow Springs, it is that those in power will fall some day. Apocalyptic art and poetry, accented by the hammers of destruction create accidental cubist works. Perhaps the best example of "sledgehammer cubism" is the Prophet, seen here in a time-lapse animated GIF image. 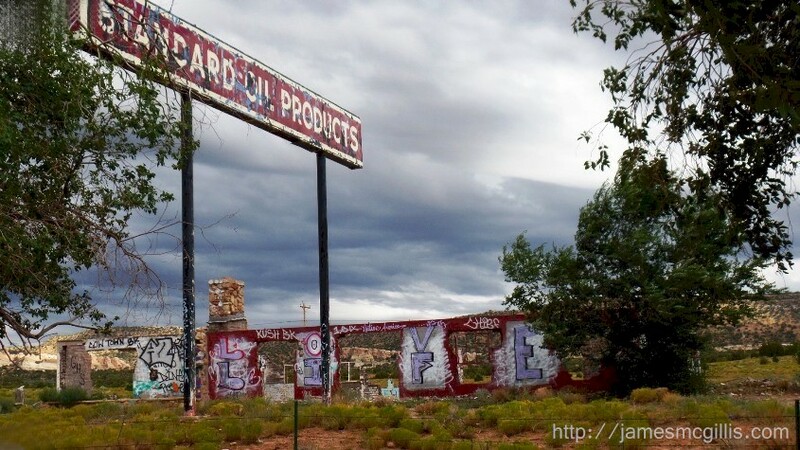 Not many years ago, the Prophet appeared on a prominent wall of the ruin. Evocatively painted with both brushstrokes and spray-paint stencils, destructionist wrecking crews soon targeted the work. On my 2009 visit to the ruin, the concrete slab that held the Prophet’s image no longer stood. Although the image of the Prophet remained largely intact, it was now lying on the concrete floor. During my most recent visit, I noted that the visage of the Prophet had become a jumble of unrecognizable fragments. After an extensive sledgehammer attack, portions of one haunting eye and a bit of a skullcap were all that I could recognize. although rotated or tumbled into a chaotic pattern, most of the fragments remained in their places. The dramatic spray-paint profile titled “Navajo Warrior” had suffered a similar fate. Over the course of a decade or so, the female warrior mythos had suffered various graffiti-induced indignities. On this visit, I found her image obliterated by elaborate graffiti monikers. In the afternoon sun, only her red-accented left eye shone through to me. 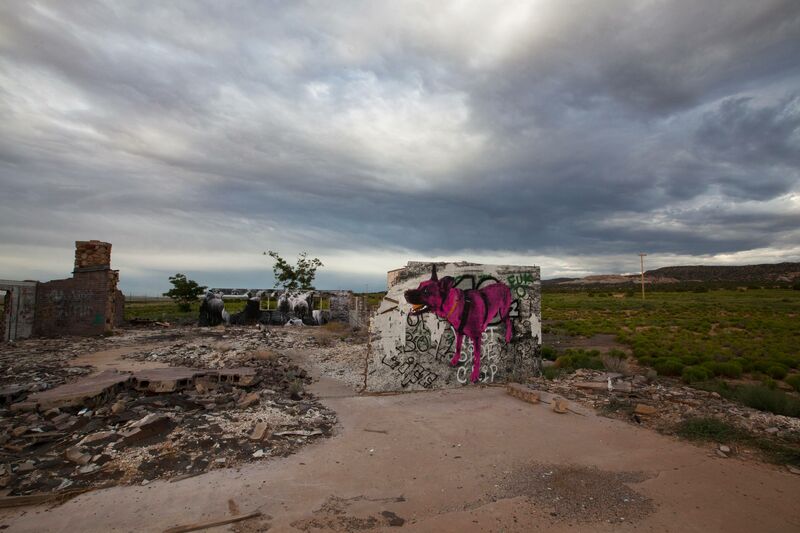 As recently as 2012, local artist Jetsonorama’s photo-mural depicting a young Navajo girl graced a prominent south-facing wall of the ruin. Resplendent in her finery, but with one eye torn mostly away, her youthful energy and optimism still shone through. A year later, beneath a welter of angry words and misogynistic art, her visage now hides from the world. As I indicated at the beginning of this story, most people opine for the day when art was beautiful and easy to appreciate. A century ago, the likes of Pablo Picasso deconstructed beautiful images into their cubic components. Likewise, unseen hands continue to deconstruct the remaining walls and art at the Cow Springs Trading Post. Those works not yet obliterated, are festooned with colorful fragments of the deconstructionists' aching souls. Recently, Ms. Dawn Allen of Greensboro, North Carolina wrote to me about her mother’s two Costantino Proietto (1910-1979) original oil paintings. Similar to other recent C.Proietto painting discoveries, Dawn’s parents acquired the pair while living in Germany during the early 1950s. Her father, Joseph Edgar Allen, was a Master Sergeant in the U.S. Army, stationed at Wallace Barracks in the Bad Cannstatt district of Stuttgart, Germany. 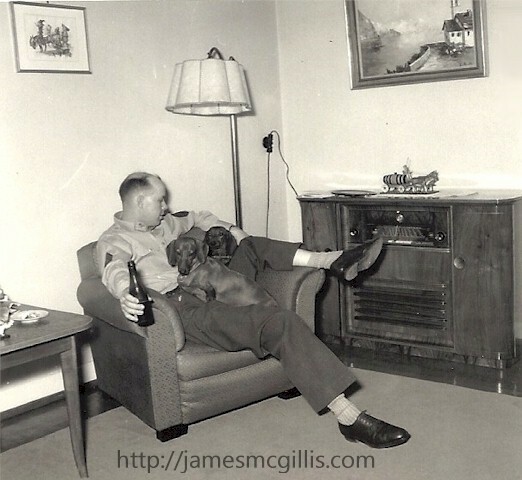 Dawn recalled, “My father was part of the 66th Counter Intelligence Corps Group (CIC), which used the Wallace Barracks installation during the 1950s. Although called a barracks, according to my mother there was no on-base housing”. She went on to say, “They lived in an apartment through ‘German requisition housing’ at Saarstraße 13 E, . Some regular German apartment complexes were designated for U.S. military. My mother, Mary Alice Allen recalls one side of the street being for U.S. military, with German citizens living across the street. After his first deployment to Stuttgart, he went to Fort Holabird in Baltimore, Maryland and then back to Stuttgart. They purchased both paintings during his first tour in Stuttgart”. One day in 1953, Mr. Costantino Proietto knocked on their door, selling his artwork. They purchased a single oil painting, later buying another. The paintings hung in her parents’ apartment in Germany and then traveled to Baltimore Maryland. When Ed Allen retired, the couple moved to Brevard, North Carolina, where both paintings continue hanging in the Allen home. Dawn Allen continued, “I’ve attached photos of the two oil paintings, plus two receipts for purchase of the paintings, which my mother had kept all these years. 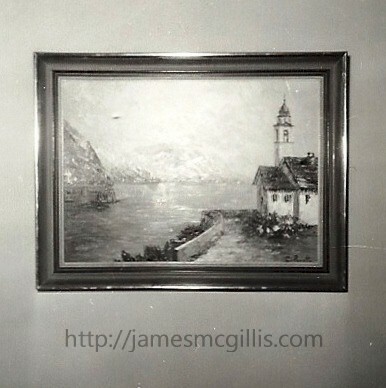 The old photos include one of a C.Proietto painting hanging in their German apartment. Another is of my father at that time, including the same painting hanging on their wall. During a recent visit to her house, my eighty-eight year old mother suggested that we “Google” the artist’s name. It was then that we found the information on your website”. From family photos, Dawn Allen determined that the first of her mother’s paintings was purchased in 1953 and the other in 1954. Despite her age and sixty years gone by, Mary Alice Allen knew exactly where to find the original receipts for the paintings. She recalls that they purchased each painting at a different time. Each time, Mr. Proietto traveled about seven kilometers to the Allen's apartment. Although they did not specifically ask him to return, a few months later Costantino Proietto called again, with more paintings to offer. What Dawn Allen calls the “Steeple Painting” has an artist’s inscription on the back. 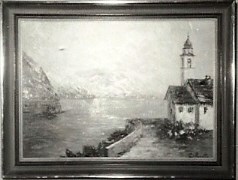 It reads, “Lago Maggiore, Locarno, Sv, Ytaliana”. 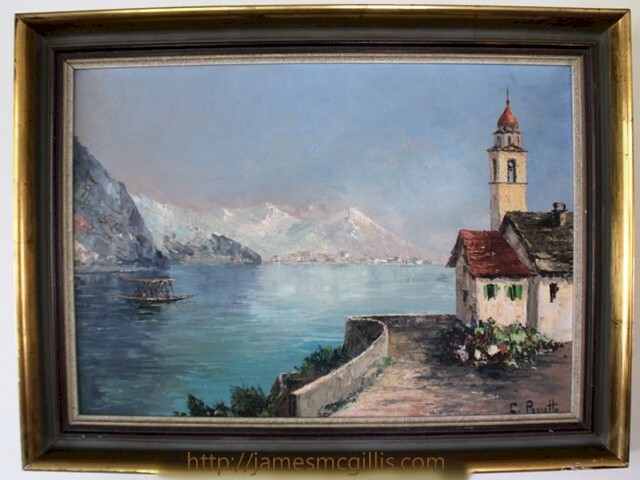 From the inscription, I believe the painting depicts Locarno, Switzerland, including a southern view toward Italy, which is on the far bank of Lago Maggiore. An extensive search of images on the internet does not produce a photograph of that particular steeple, or tower. 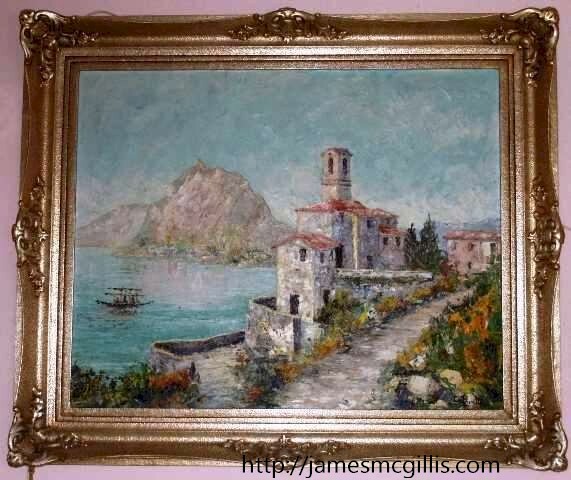 However, my own original Costantino Proietto oil painting of “Lago Maggiore, Ascona” (bottom of page) depicts a rowboat identical to the one in the Allen Family “Steeple Painting”. The second Allen Family C.Proietto is harder to place. With no inscription on the back and no mention of subject matter on the receipt, it could be of any Swiss or Italian lake. However, there is one clue that might help place the location of the “Lake House” (above), as the Allen family calls the painting. Immediately after the initial publication of this article, C.Proietto collector Jeffrey Muenker sent me a photo of his own "Lake House" painting (left). Both the Allen Family "Lake House" and the Muenker Family painting appear to have used the same photo as their origin. There are subtle differences, including the absence of a lower window and the addition of a flowering plant on the Muenker Family painting. Each C. Proietto acquisition story is unique, although many center on American GIs stationed in postwar Germany, and mostly near Stuttgart. 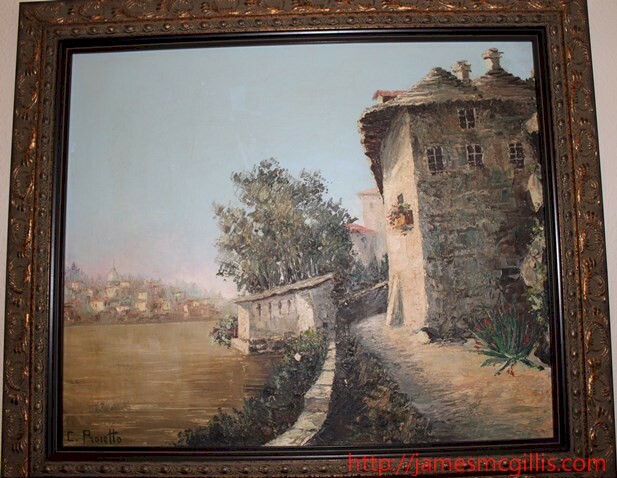 The impeccable provenance of the Allen Family C.Proietto paintings is peerless. 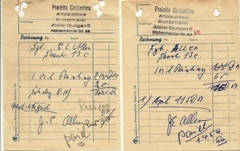 The receipts pictured here are the first known sales documents created by the artist. 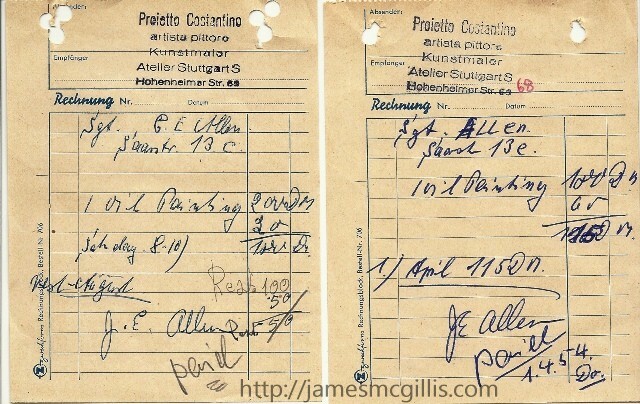 Written in Costantino Proietto’s hand and signed by the purchaser, J.E. Allen, they offer some interesting details about the purchases. The receipt on the left shows a date of “8-10”, indicating final payment (and delivery?) 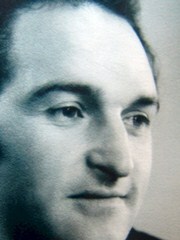 in August or October 1953. It reads, “1 oil painting - DM 200", with 50% down and two additional payments of DM 50. In pencil, at the bottom, the receipt is marked, “Paid”. The other receipt was for DM 115, and paid in full on January 4, 1954 or April 1, 1954, depending on the use of American or European date standards. 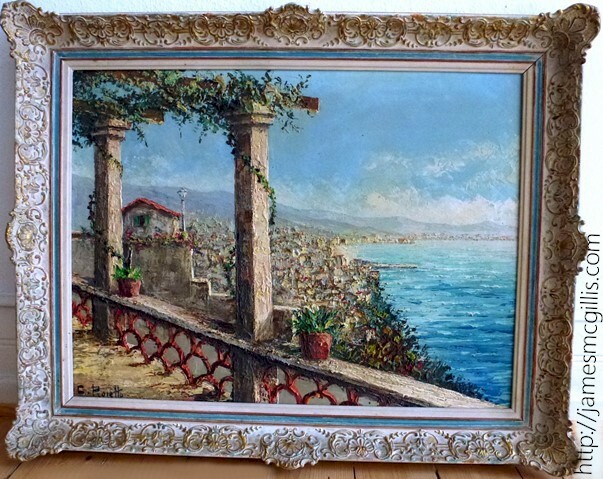 There is no mention of framing, but Mary Alice Allen tells us that both were sold in identical frames. 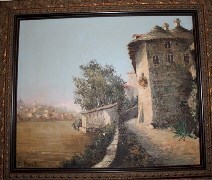 Most C.Proietto paintings were sold unframed. At the top of each receipt is a rubber-stamped impression, including the artist’s name and address. Also appearing is the German word, “Kunstmaler”, meaning “Production Painter”, when translated into English. As an Italian, living in Germany during the 1950’s, the artist also included the words, “artista pittoro", loosely translated as “picture artist”. 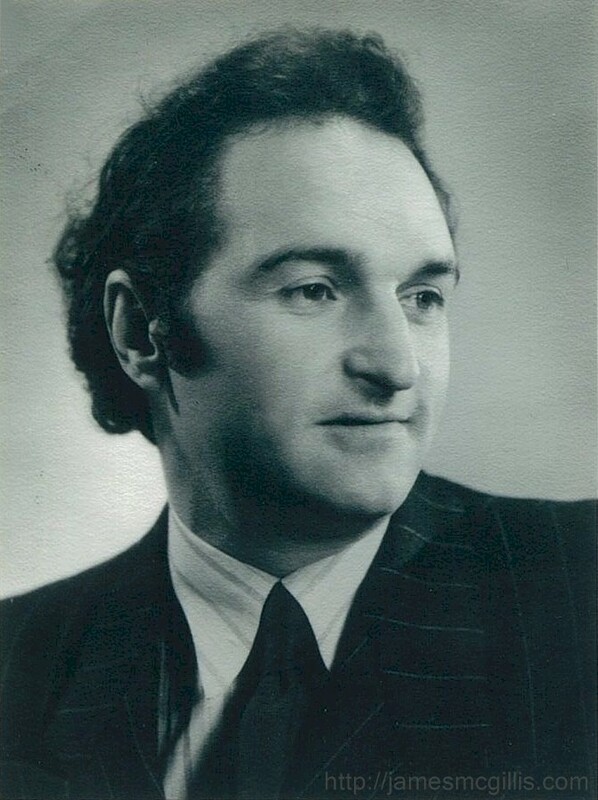 Despite his skill and expertise, Costantino Proietto painted for the people, often selling his paintings door-to-door or at U.S. Post Exchange exhibitions throughout postwar Germany. The good news for C.Proietto collectors is that there are perhaps thousands of his works hanging undiscovered on walls all over the world.